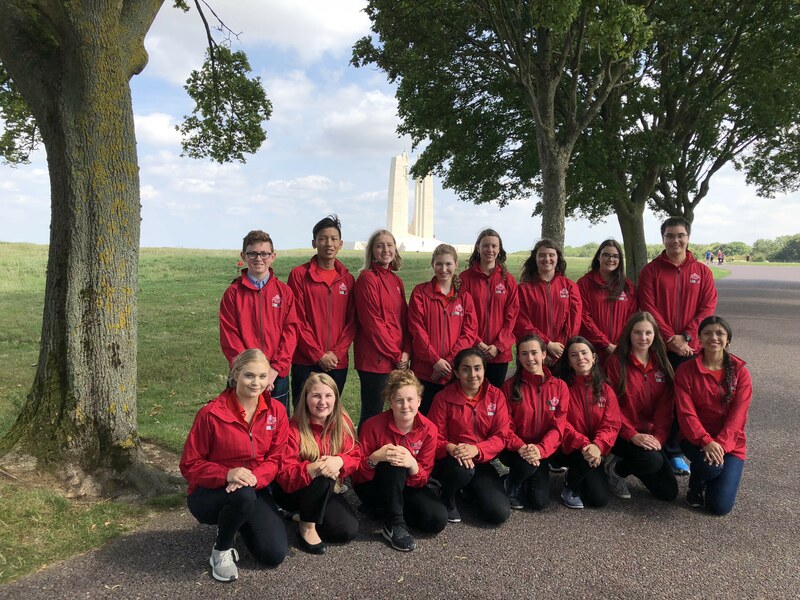 Aujourd’hui, nos récipiendaires du PVB 2018 ont visité le Mémorial national du Canada à Vimy: il s’agit d’une journée importante et émouvant pour nos participants. Le groupe a visité le Centre d’acceuil et d’éducation de Vimy où ils ont tourné les tunnels de Vimy avec Kate d’Anciens Combattants Canada. Dans l’après-midi, ils ont participé à une cérémonie privé à Vimy où Cassidy et Ghalia ont lu la Promesse de se souvenir alors que Gordan, Anna, et Brooke ont deposé une couronne. Pour finir la journée, les étudiants ont visité des sites dont Notre Dame de Lorette, l’Anneau de la mémoire, Cabaret Rouge, Neuville St-Vaast, et Maison Blanche avec le Groupe Durand. (À noter: les participants blogueront dans leur langue préférée). Seeing the Vimy Memorial was something I had been excited for since being awarded the Beaverbrook Vimy Prize, but nothing prepared me for the actual experience. Driving up to the memorial, I was struck by the solitary white structure standing in the middle of a grassy field, once the site of Canada’s bloodiest battle. During our solitary reflection period, I walked the perimeter of the memorial, absorbing the multitude of names inscribed on the walls. Pausing a moment to take everything in, sat on the pure white steps and put a hand to the stone. It was cool against my skin as I searched for a word to describe the emotions I was feeling. I felt sorrow, but also a vague sense of gratitude and contentment. When I stood before the stature of Mother Canada, belting out our national anthem, my heart was full of pride. As our voices blended together, I felt like I was a part of something bigger, just as our soldiers were as they stood on Vimy Ridge. Though a hundred years separate my time and theirs, today I was proud to stand on the ground where they fought, and most of all, proud to be Canadian. I felt a lot of different emotions today when going to the Vimy Memorial, Maison Blanche and giving my soldier presentation. When we arrived to the Vimy Memorial, we had half an hour of silence. We could walk around and look but we could not talk. During this time, I reflected on what the men whose names were on the wall went through. I couldn’t even begin to but I tried my best to empathize with them. Following our visit to the Vimy Memorial, we visited the Vimy Educational Centre where we toured the tunnels. Going through the tunnels was a very educational experience, however the tunnels we visited at Maison Blanche were much more preserved in their original state. Comparing the two sites gave me insight into how historical sites can be manicured for the public. As I mentioned before I did my soldier presentation today. It was a very emotional experience because I felt like my work wasn’t done there. I wanted to be able to commemorate my soldier even more but I didn’t know how in the moment. I wish I could converse with him but that isn’t possible so I was left feeling somewhat empty in a way. Today we visited the Vimy Memorial and the area around it. We started off at the visitor centre, where we learned about some of the geography of the battlefield and the magnitude of the Front and the forces involved. We then toured the preserved trenches and a section of the tunnels underneath them. This gave a sense of the confined spaces that the soldiers worked in, but not of the terrible conditions. We then went to the memorial itself and explored it in silence for thirty minutes. I found that during this time I was able to truly experience something which you could never experience without being there: the feeling of a personal connection to every name carved into that stone as a person who was once just like you or me. We later travelled to Maison Blanche where we were given the privilege of entering the tunnels of an ancient underground chalk mine that was used to house soldiers during the First World War. It contained a multitude of carvings or “graffiti” which are very significant in the understanding of the thoughts and attitudes of the soldiers who stayed there. The general themes found in the carvings were those of pride in country and fighting unit, and homesickness. I found it to be an especially unique way of gaining insight into the mindset of soldiers in the First World War. Finally, to end the day, we returned to the Vimy Memorial to spend more time with it while there were fewer other people, and to see it lit by spotlights after dark.